This is the new version of the Sustainable Transport Club newsletter. Check out what is going on with EVs, Bikes and more. Welcome to the New Format for the Sustainable Transport Club Newsletter. The internet finally nudged us to use a better mailing technology due to our increasing numbers. The new technology lets you control what you receive from us by using the links at the end of this newsletter. The new format should let you browse the news easily and quickly. There are lots of good things happening so please enjoy. You signed up to receive this newsletter by putting your name and address on a form or giving us your business card. You would have done this sometime between 2004 and now at one of the many events where our people have helped to build this network. Please do not mark this as spam. Doing that makes it harder for us to get emails to other people. That is particularly true if you are part of a large organization like a city or a university. The links at the end of this newsletter will let you do whatever you need to do and quickly. That includes letting new people get on the list for future newsletters. The move to Sustainable Transportation is happening and we are part of that. The next few years have very exciting prospects and there are things you can do to help move that forward. Details are below. The National Plug in Day 2013 is moving forward with over sixty locations. People around Southern California and across the country are working together to support electric vehicles. 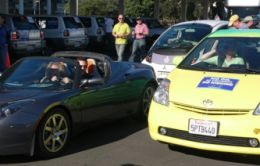 You are invited to join us for a day of team spirit with other EV drivers and enthusiasts. This event is specifically to answer question for EV curious, so they are very welcome. Help the next wave of EV drivers to learn that EVs are here and they work great! In addition to having some great locations there will be some awesome activities like ride and drives. Here in Ventura we will have some music there as well. The mainstream is slowly warming up to EVs. What is it that the mainstream needs to start using EVs? What will it take to get that to happen really quickly? These questions are really asking how to make EVs super contagious. The upcoming book series Energy and EV Secrets is focused specifically on that goal. There are two volumes well on their way and a third in early development. One of the many parts involved starts by touching everyone’s personal needs The idea is that they can take the pain at the pump and let it drive them to the EV Solution. Another part is taking away the fear of making the change and showing them how to do use EVs easily and effortlessly. Energy and EV Secrets Available by National Plug In Day. The City of Thousand Oaks along with the County of Ventura has installed the newly operational DC Fast Charger. It is a Blink Unit installed at the intersection of HWY 101 and Hwy 23. Special thanks are due to Stan Cowan at the VCAPCD and Graham Watts with the City of Thousand Oaks. This opens up a whole area of travel for EVs in this region. This is a good example of how to expand your regional driving in an EV. Here are the specifics. This will work for LEAF drivers and MiEV drivers and any vehicle with the Chademo Quick Charger equipment. Sorry this does not work for Tesla’, RAV4 EVs, or the upcoming Chevy Spark EV. We have all seen videos go viral. The iPhone and iPad showed us how technology can be contagious. Now we need EVs to go to that level and get as many EV drivers as we have iPads users. There are many parts to taking the technology to that level. We have a good toe hole with over 40k EVs at the start of 2013. That still leaves 250 million more passenger vehicles to turn into EVs. Ok let’s just shoot for the first million! The recently released book called “Contagious” goes into detail about how this works. It can be a good guide for the EV community to figure out how to become more effective in our work. 1855 Main Street in Santa Monica. The fleet conference will take place from 10 a.m. to 5 p.m. on Friday, September 20. This year’s event will feature a number of vehicle debuts as well as a free-to-the-public, Ride & Drive that will include: electric, natural gas, propane, biofuel, ethanol, hydrogen fuel cell and hybrid powered technologies. A “Ride & Drive” event and car showcase is free-to-the-public from 10 a.m. to 5 p.m. both Friday and Saturday. Copyright © 2013 Sustainable Transport CLub, All rights reserved.